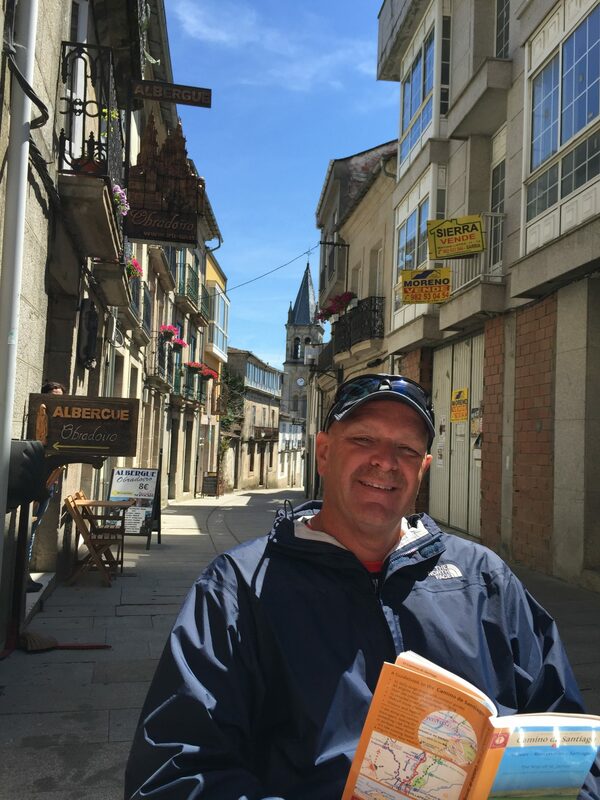 Walking the Camino de Santiago--My Favorite Vacation! Walking the Camino de Santiago–My Favorite Vacation! 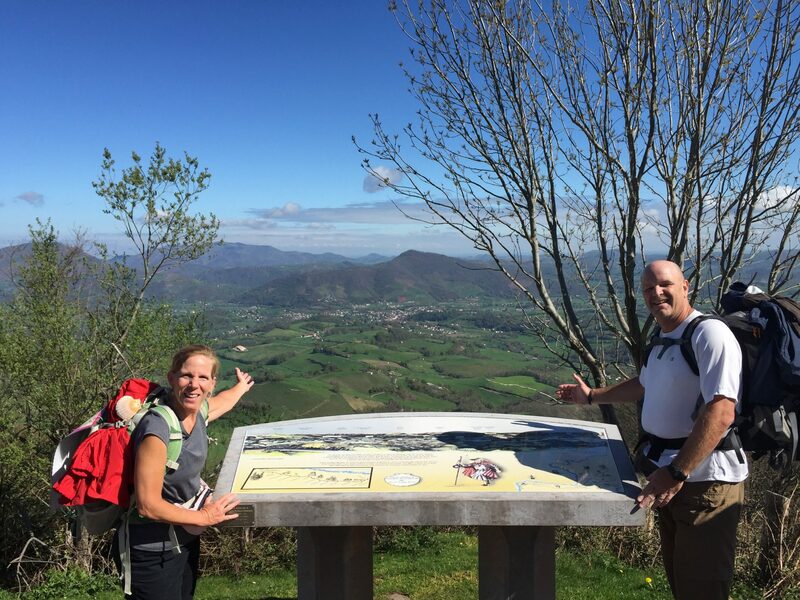 My husband and I recently got back from a 6-week trip walking 500 miles on the Camino de Santiago, from Saint Jean Pied-du-Port in France to Santiago de Compostella in Spain. 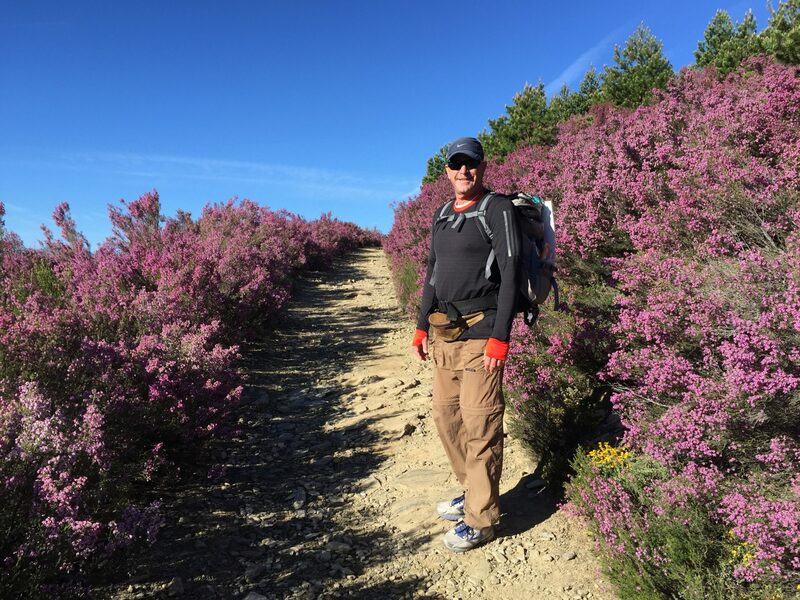 We have traveled a lot–to more than 30 countries, sometimes for months at a time–but walking the Camino is truly unique. From Day One, it became my favorite vacation because it combined hiking, sightseeing and culture while meeting people from all walks of life from all over the globe. Plus, it was one of the least expensive vacations we have ever taken. It’s not as cheap as Asia but it was definitely the cheapest European vacation we have taken. On average we spent about $80 per day as a couple staying in private accommodations and splurging all along the way for 35 days. 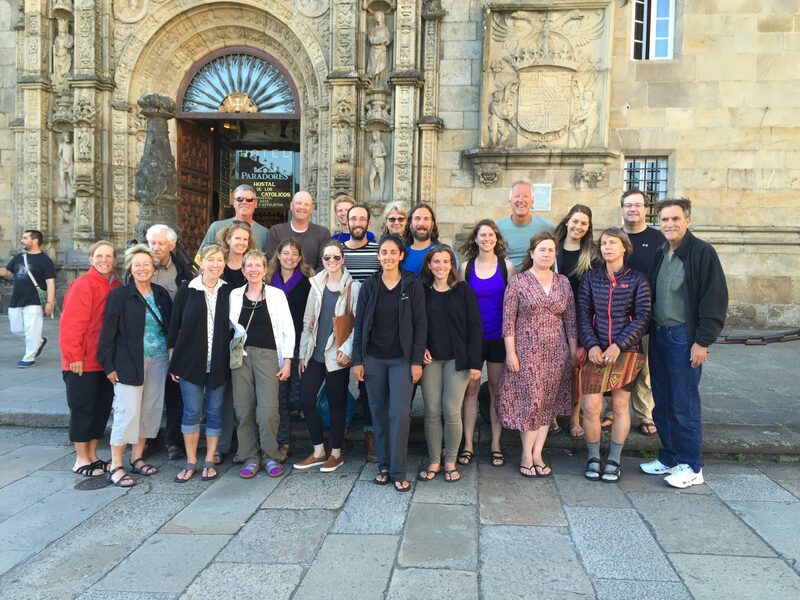 The Camino is a 1000-year-old Christian pilgrimage that is now more of a cultural experience for people of many faiths from around the world. 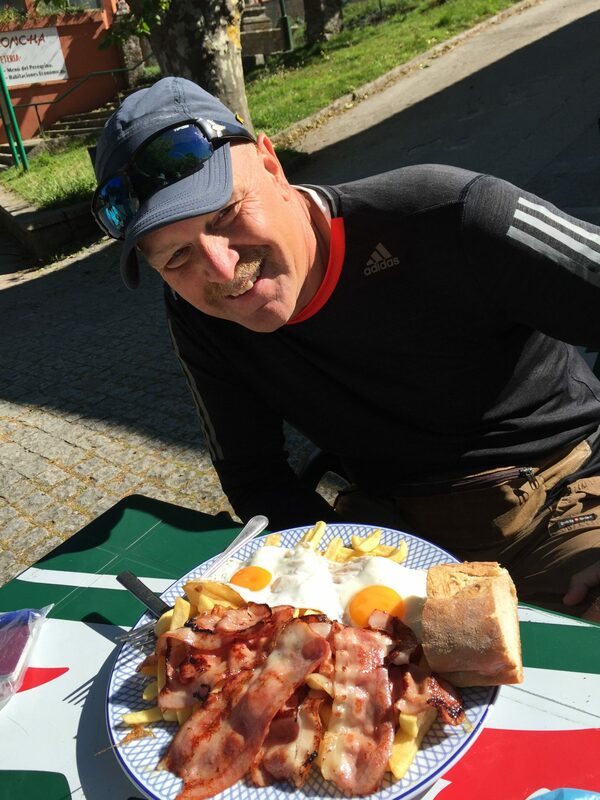 Most people who don’t know much about the Camino can’t imagine how anyone can walk such a long way and they assume one must be in excellent physical condition to take on such a feat. That is absolutely not true! All you have to be able to do is put one foot in front of the other for a few miles at a time. If you can walk one mile, you can walk 500. It took us 35 days to walk 500 miles but we met a 90 year-old woman who finished in 25 days. 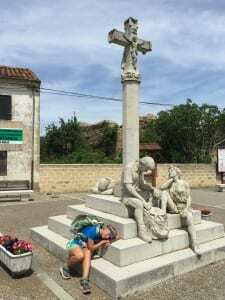 We met several people who ran the Camino in just over two weeks, and we met other people who were taking it very slow with several months to reach Santiago. Also, you can begin anywhere along the way to shorten the distance. We flew coach from Los Angeles to Madrid (via Dallas) on American Airlines using miles. It was a really old plane and my seat didn’t fully recline, which was extremely uncomfortable. I landed in Madrid with a killer backache and no sleep. After the Camino when we arrived in Santiago de Compostela we used British Airways Avios points transferred to Iberia to fly one-way from Santiago to Paris. The flight was actually operated by Vueling, a no-frill airlines. Lastly, we spent a few days in Paris and then used American Airline miles to fly partner airline Air Tahiti Nui from Paris direct to LAX. Overall, we saved approximately $3,000 in airfare using miles. We spent 3 nights in Madrid before we headed to northern Spain to start the Camino. We have friends living there and they took us to some fantastic tapas bars and out to their mom’s house in the countryside for a big paella party. We stayed at an AirBnB apartment. This is the third time we have used AirBnB but the first time we booked a room in an apartment rather than the whole apartment. The apartment was fantastic, in a nice location and priced at $65 per night. As it happened, the owner was out of town for the weekend so we had the entire place to ourselves. I purchased tickets from Alsa buslines online in advance and we paid €10 each to take a bus from Madrid to Pamplona. The entire trip was 3 hours with one very brief stop along the way. 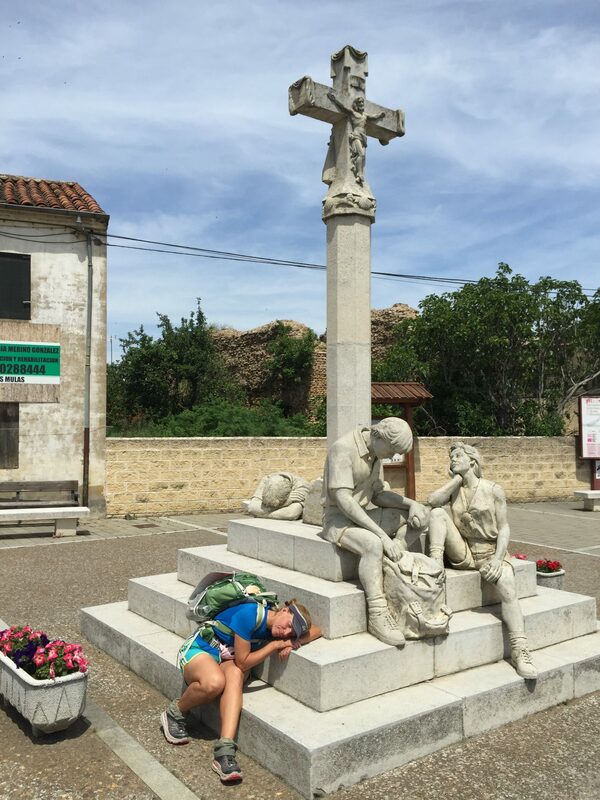 I did not do much research about the Camino de Santiago before our trip because I didn’t want to have strong expectations; I wanted to be surprised by the experience. 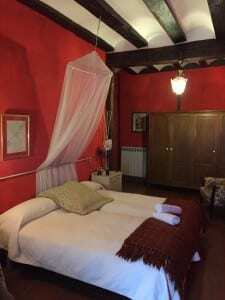 Therefore, I did not know how many lodging options were available on the Camino. I expected everything to be like the communal accommodations like in the movie, The Way. Fortunately, most towns and villages have options from nice hotels to basic dorms for all budgets. Our very first night we decided to ease into the Camino and enjoy a more relaxed walk through the Pyrenees Mountains with our first night at Refuge Orisson, which is a small lodge only 6 miles from St. Jean. In hindsight, I wish we would not have been so enthusiastic to start the walk and had spent a few hours wandering around St. Jean because it only took two hours to walk to Orisson. Orisson only has shared rooms (6 and 10 people per room) and you are provided dinner and breakfast. We loved the experience of Orisson! We spent the entire afternoon chatting with other people beginning the walk and were able to create a unique bond right from the start. 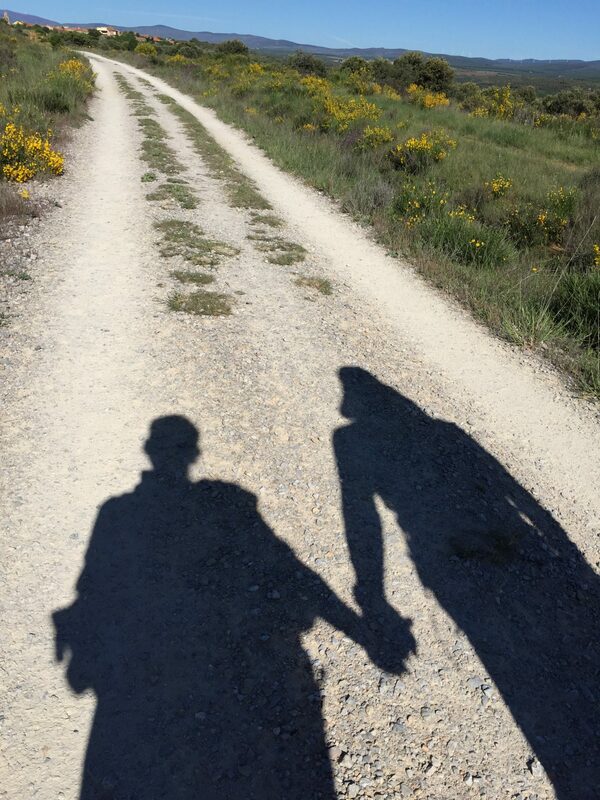 There are many opportunities to form friendships throughout the Camino but I think Orisson is special. The cost for dinner, lodging & breakfast is €35 per person. After Orisson, all other towns have the option of shared accommodations or private rooms in pensions or hotels. Obviously, shared rooms are much cheaper–usually €8-12 per person, per night. Some religious institutions have cheaper dorms and only ask for a donation only but we didn’t stay in this type of facility. Our second night we stayed in the massive communal dorm in Roncesvalles, which was an old monestary. The interior is very modern and the experience was like being in adult summer camp but it wasn’t a good night’s sleep. From that point on, we stayed in private rooms. Most of the private rooms we stayed in averaged between $25-45 per night. Most had a private bath but some did not. All of them were very clean. One or two were what I would consider bare-bones, while others were very comfortable with flat screen TVs, nice linens, etc. In the larger cities (Pamplona, Burgos and Leon) we splurged and spent $50-70 per night for rooms with large bath tubs (for long soaks!) and nice views. We traveled in late April and through May, and for the most part it was not necessary to make reservations in advance. We met people who had pre-booked their entire vacation and others who did not book anything and just stopped walking when they saw a village they particularly liked. Excellent food is very inexpensive in Spain. Of course, you can spend a lot but it is not necessary. And, while on the Camino almost every bar, restaurant and cafe has a special dinner menu with a starter, main course, dessert and wine (usually unlimited!) or beer for under $12 per person. For breakfast the dorms and inns usually have a simple breakfast of toast, juice and coffee for about $3, and the bars and restaurants offer something more substantial like eggs or potato pie (tortilla) for about the same price. Lunch is usually a giant sandwich called a bocadillo. Generally we woke up at 7 a.m. and were out the door by 7:30. We would walk about 3 miles before we stopped at a cafe for breakfast. Then we walked about 7 more miles before lunch, another 5 miles before a snack like cake or chocolate, and finally walked another few miles to the town where we would sleep. After a shower and rest, we would meet friends we met along the way that day at a local bar for a beer before going to a cafe for an early dinner. Dinner on the Camino usually starts at 7 p.m. and everyone is asleep by 10 p.m.
Breakfast! All this Food for $3! Almost every village has a cathedral and often an ancient bridge. The larger towns like Pamplona, Logrono, Burgos, and Leon have enough to see to spend a few days. Many people do not spend extra time in towns unless they really need a rest from walking but Bob and I wanted some sightseeing like we do during a “normal” vacation. Plus, we really did need the extra rest from walking. During our rest days in the larger towns we slept in and relaxed all morning and then discovered wine tasting rooms, tapas bars, quiet parks in the afternoons. By the next day, we were ready to walk again. Burgos was our favorite town and the next was Leon. 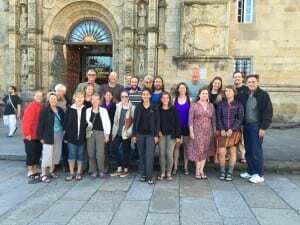 We have a friend who lives in Logrono so that was special because we got an insider’s tour of the city, and a few days later she and some of her friends met us in Santo Domingo for a special festival. There’s something new every day along the Camino de Santiago. I’ve written about the logistics of getting to and walking the Camino, but what made it such a unique vacation for us was the people we met along the way. Every day, almost every hour (or more often) we chatted with fellow pilgrims. Everyone says hello and most are interested in spending at least a few minutes talking with you as you walk together. Sometimes you have a lot to talk about and you end up walking miles and having a meal together before you part ways. Sometimes you walk with new friends for a few days until you part ways. Quite often you run into people you met a week ago and suddenly you have the chance to catch up with them before you part ways. 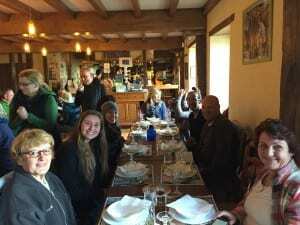 We met hundreds of people along the Camino and many of them became good friends. Bob and I are not very good keeping up with people so I’m not sure how many of them will remain in our lives but they will be part of our experience forever. I did not enjoy every day along the Camino. A couple of days were very long and hot, and I was exhausted. We were lucky that it only rained a few days, but those were not enjoyable for us. We were lucky and did not get blisters but many people had them and walked in significant pain for days until they healed. However, out of 35 days I think probably five were not enjoyable. 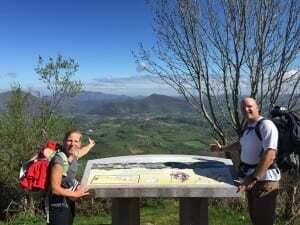 Should You Walk the Camino de Santiago? Oh my gosh, if you have read this far, the answer is YES! If you can find the time to do it, by all means, go for it! The statistics are amazing about who walks the Camino de Santiago, it’s an incredibly diverse population of people generally 18-90 years old, male and female, married walking with our spouses, couples and singles. Teachers, lawyers, doctors, hippies, retirees, college students, homemakers, artistic…why not be one of them, too? You will not regret it. You Should Walk the Camino! Is Flying Business Class Worth the Miles Spent? Portland and the Oregon Coast Cheap–Wow, The Coast!